In June 2012, Google announced that it was making a cloud computing service. So how does it work and what can it do for you? The Compute Engine is Google’s answer to Amazon’s EC2 web service. 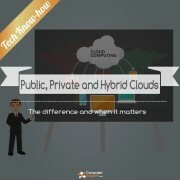 Essentially both are cloud infrastructure services. What that means is that Google and Amazon are offering digital resources: disk space and computing power. Instead of buying a dozen fancy servers, you can run your network off theirs. These networks are all about centralization. If you have offices all over the place, they don’t need to have their own major IT hardware, it’s all under Google’s purview. Initial beta testing reviews show that Google has stepped up to the challenge. According to Gigaom, GCE is about four times faster in booting virtual machines and about twice as fast at writing ephemeral disks. Like all Google products, the pricing will range from free to premium. The highest pricing tier will cost $150 a month. Application hosting will be free for the first 28 instance hours (reset daily) for on-demand front-end instances and 8 cents an hour after that. Managed IT Services Pricing: Are You Overpaying?